The sauce was really solid. I loved the touch of creaminess to it. The fresh mozzarella was also fantastic and I’d be lying if I said I wasn’t left wanting more. This was both because of it being good and because it was just like a dollop. The pasta itself was good, but not great. I prefer my gnocchi to be on the softer side and this wasn’t, so whatevsies. But would I get it again? Yeah, no doubt. 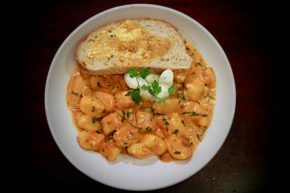 Even decent gnocchi is still better than most good other pasta, and this was definitely better than decent.